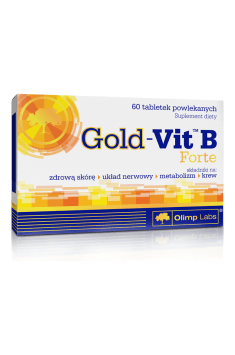 OLIMP Gold-Vit™ B Forte is a dietary supplement with key eight B vitamins in healthy doses. It is available in the form of coated, easy-to-swallow tablets. The formulation effectively corrects deficiencies of basic B vitamins. It is recommended especially to persons who have an increased requirement for these vitamins, namely convalescents and persons who may be under a heavy physical or mental strain. It will be also useful especially for persons who do not follow a healthy diet, often eat junk food and use stimulants. Vitamin B1 (thiamine) is a cofactor of over 24 enzymes. It has a key role in metabolic processes and is required for energy production from food. It may reduce fatigue. What is more, it has an impact on nervous system function – it takes part in the formation of myelin surrounding neurons, is involved in the synthesis of GABA, i.e. one of the most important neurotransmitters, and is critical to the production of acetylcholine that is vital to memory formation. The vitamin has also an analgesic effect and is sometimes used to treat back pain. Vitamin B2 (riboflavin) is a precursor to FMN and FAD – two important coenzymes which are cofactors of key reactions in the body’s energy production. What is more, it cooperates with folates and may lower homocysteine levels. It is critical to the conversion of vitamin A into retinoic acid and supports a healthy skin and mucuous membranes. It shows analgesic properties, reduces pain associated with inflammation and enhances the antinociceptive effect of morphine. Its large doses are also used to treat migraines. This vitamin plays a huge role in iron utilisation in the body and may be helpful in anaemia. Vitamin B3 (niacin) is one of the substances which are the most effective in increasing serum HDL levels. Furthermore, it helps lower LDL cholesterol levels and thus promotes a healthy cardiovascular system. Thanks to this vitamin, you can slow down the body’s ageing – it has a beneficial impact on mitochondrial function and inhibits the shortening of telomeres, localised at the end of chromosomes. It is worth remembering that when chromosomes do not have telomeres, cells cannot divide and die. This vitamin may also promote the conversion of tryptophan into serotonin, consequently improving sleep quality (tryptophan metabolism leads to the formation of melatonin – a key regulator of the circadian rhythm). Vitamin B5 (pantothenic acid) is a precursor to coenzyme A which functions as a cofactor in over 70 enzymatic pathways. It supports the function of adrenal glands and is involved in the synthesis of hormones released by the adrenal cortex. Pantothenic acid deficiency correlates with impaired testosterone production. What is more, studies on animals have revealed that it has also a negative impact on testosterone levels. In athletes, vitamin B5 may improve oxygen utilisation and reduce lactic acid build-up during strenuous exercise. Furthermore, it supports a healthy skin and hair. Vitamin B6 (pyridoxine) is a cofactor of over 110 enzymes. Thiamine has a key role in maintaining healthy function of the nervous, osteoarticular, immune and cardiovascular system. It is involved in the production of all the most important neurotransmitters. It has a key role in methylation and activates enzymes necessary for the conversion of homocysteine into cysteine. In addition, it inhibits the release of proinflammatory cytokines. It boosts the uptake of magnesium and helps maintain its healthy levels in the body. Vitamin B7 (biotin) is commonly associated with improving appearance and is recommended especially for persons who suffer from impaired quality of the skin, hair and nails. Actually, it has many more important roles. It is involved in the formation of myelin which protects neurons and speeds the transmission of nerve impulses. Its large therapeutic doses are used successfully to treat multiple sclerosis. What is more, biotin has a beneficial action on the immune system. Its deficiency may be manifested in severe fatigue and studies on humans and animals show that it often correlates with a low mood and depression. Vitamin B9 (folic acid) is especially vital to pregnant women – it is critical to foetal development and reduces the incidence of birth defects. Furthermore, the vitamin takes part in methylation and plays a key role in homocysteine metabolism. It is also involved in the synthesis of serotonin, dopamine and norepinephrine. Folic acid deficiency has been shown to aggravate symptoms of depression and lead to a poor treatment reponse to antidepressants (e.g. flutoxetine). Vitamin B12 is actively involved in methylation and metabolism of homocysteine which is dangerous for health. It also takes part in the production of red and white blood cells. It protects against anaemia and boosts the immune system. What is more, it helps maintain healthy nervous system function – it participates in the production of several neurotransmitters and is a prerequisite for the formation of myelin around nerve cells. To sum up, OLIMP Gold-Vit™ B Forte is an excellent choice for individuals with a deficiency of B vitamins. The supplement is recommended especially for an increased demand for these vitamins in the body. Its adequate doses effectively make up deficiencies and help easily maintain healthy levels of B vitamins in the body. Microcrystalline cellulose, cross-linked carboxymethylcellulose sodium - fillers; lactose; calcium phosphate - binder, magnesium stearate - anti-caking agent, polyvinyl alcohol, polyethylene glycol, talc, potassium aluminum silicate, polyoxyethylene sorbitan monooleate - glazing agents; titanium dioxide, iron oxide - colors.